Maxim Mironov (Orpheus) with dancers from The Joffrey Ballet, in LA Opera's production of Orpheus and Eurydice, 2018. Photo: Ken Howard. Too often, opera directors are referred to as “theatrical geniuses”, but the success of their productions are almost always a collaboration with great designers and, in the case of operas with ballet passages, great choreographers. 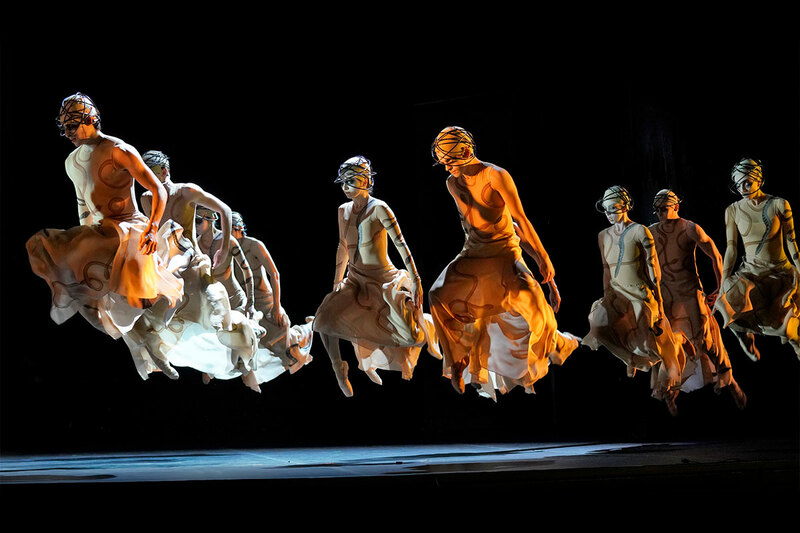 With Orpheus and Eurydice, however, which just began its run at LA Opera, “theatrical genius” can justifiably describe the work of one man working alone - John Neumeier. He is not only the director of this production, but also the choreographer, set designer, costume designer and lighting designer. Talk about a single vision. And what a visionary. Temur Suluashvili and Victoria Jaiani, two dancers from The Joffrey Ballet, as Orpheus and Eurydice in the “Imaginary Ballet” that concludes LA Opera’s production of Orpheus and Eurydice, 2018. Photo: Ken Howard. Though he has a decades-long, international reputation for his ballets, Mr. Neumeier’s ingenious and beautiful choreography is only part of the story, or rather “his” story. Writers are supposed to write what they know; in this case, Mr. Neumeier directs what he knows. This is the famous opera written by Gluck in 1774, but it’s no longer the travel and travail of a musician. In Mr. Neumeier’s concept, Orpheus is now a choreographer. And while we’ve seen so many directors who try to thrust themselves in between the work and the audience, in this case, the director’s conceit enhances our understanding of how Orpheus (and his art) are infinitely transformed. Liv Redpath (Amour) and Maxim Mironov in LA Opera’s production of Orpheus and Eurydice, 2018. Photo: Ken Howard. 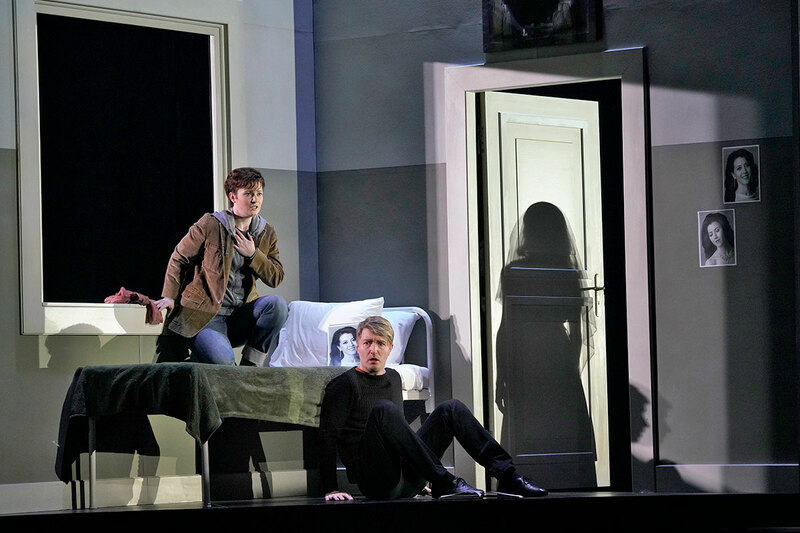 Lisette Oropesa (Eurydice) with Maxim Mironov (Orpheus) rear left, in LA Opera’s production of Orpheus and Eurydice, 2018. Photo: Ken Howard. 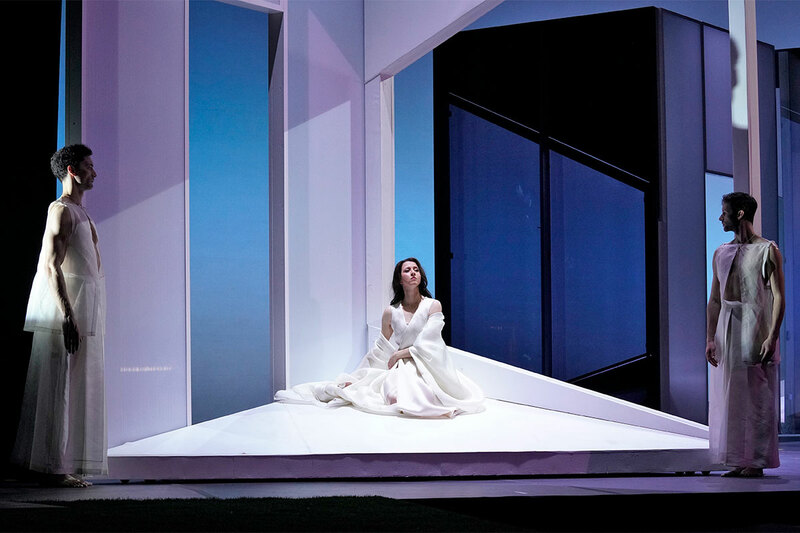 Lisette Oropesa (Eurydice) in LA Opera’s production of Orpheus and Eurydice, 2018. Photo: Ken Howard. 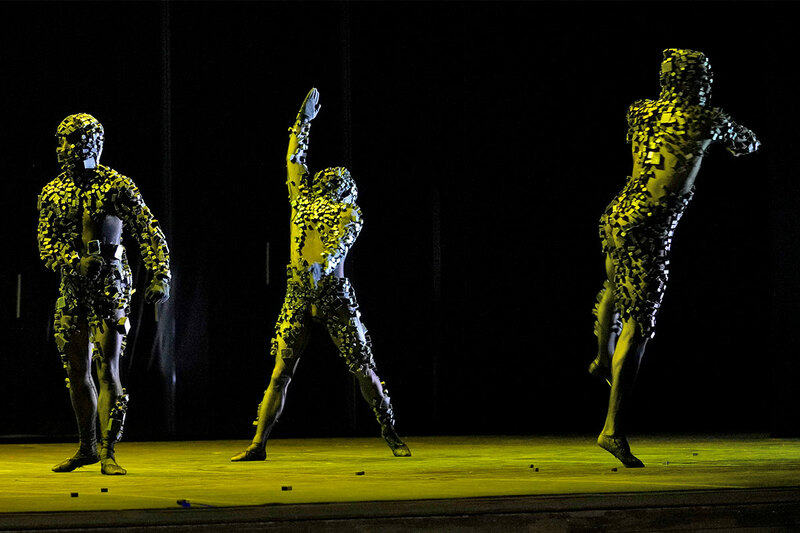 Neumeier’s take begins with Orpheus trying to create a new dance with his ballet company. The members are all over the place trying different moves - some in small groups, some in pairs. Orpheus is clearly looking for inspiration. We’ve been introduced to a painting of his set design on an easel. But his work on the piece that will appear in front of that backdrop is only just beginning. Eurydice is the prima ballerina, and right after we are introduced to her, she has a fight with Orpheus and leaves the rehearsal in anger. And this all happens during the overture. Blackout. Fabrice Calmels and Jeraldine Mendoza, two dancers from The Joffrey Ballet, in LA Opera’s production of Orpheus and Eurydice, 2018. Photo: Ken Howard. When the lights come up, we see Eurydice dead on the ground. Off to the side we see that she has crashed her mini-Cooper into a saguaro cactus in the middle of the night. In the hands of anyone else this would be a potentially silly nod to modernism, but the scene is haunting, thanks to the minimal lighting that streams from the headlights through the steam of the broken engine. A tall, black, and spooky shadow of the cactus appears on a wall. The ballet company, now dressed in black, do their dance of mourning over the loss of their colleague as the chorus sings hauntingly unseen in the background. 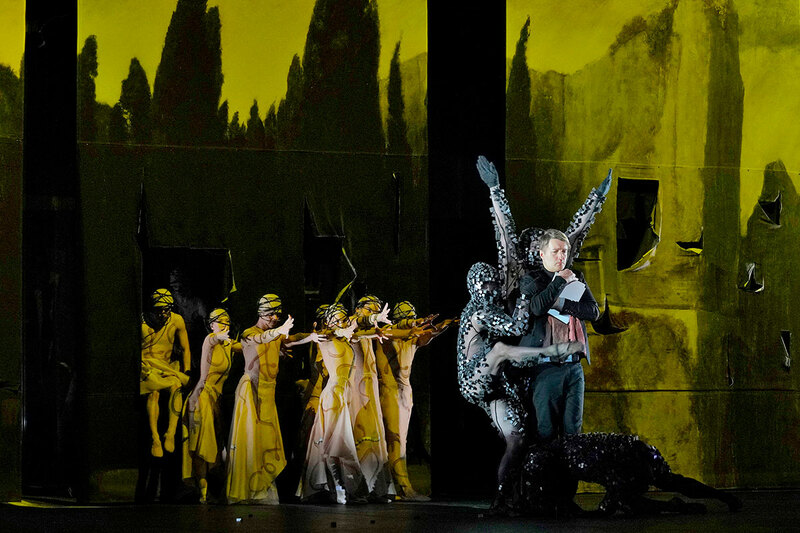 This is a perfect example of how Neumeier is able to blend his expertise in staging, dance, lighting and costumes - it all comes together to enhance the sadness and mystery found in the music that Gluck has written for the beginning of the opera. Maxim Mironov (Orpheus) with dancers from The Joffrey Ballet in LA Opera’s production of Orpheus and Eurydice, 2018. Photo: Ken Howard. Gluck’s music has been called the bridge between Handel and Mozart and you can certainly hear how Gluck inspired Mozart. (Listen closely and you’ll catch what would become “Non più andrai” in The Marriage of Figaro.) The music is endlessly lyrical, and, in the style of the time, subdued even in its most dramatic moments. This doesn’t prevent James Conlon from conducting the always spot-on LA Opera orchestra with a fevered passion that allows him to elicit the most from the score…and then some. Gluck was revolutionary, in that his music propelled the drama of the story. Ahead of his time, he was against stopping the action to allow self-indulgent singers to engage in vocal calisthenics. He does break this rule at the end of Act I, however, where Orpheus (sung by Maxim Mironov) has an aria filled with ever-climbing, very challenging Baroque trills. It’s a great moment, and it’s Mironov’s greatest. Dancers from The Joffrey Ballet in LA Opera’s production of Orpheus and Eurydice, 2018. Photo: Ken Howard. Although his voice lacks heft, he has bel canto chops and can float up to impossibly high notes with ease. The role can be sung by a more powerful tenor, but it’s often sung by a mezzo-soprano or even a counter-tenor, so we don’t feel anything is missing. Neumeier has also directed Mironov to give a moving, subtle and modern performance, which fits neatly into the production’s present-day milieu. Liv Redpath (Amour) and Maxim Mironov (Orpheus) in LA Opera’s production of Orpheus and Eurydice, 2018. Photo: Ken Howard. Orpheus enters Hades by walking through the mirrors (like Alice?) and when the mirrors are turned around, we’re now looking at a giant version of the painting that we saw on the easel during the overture. To our surprise, the hands, feet and faces of the Furies burst through the painting, grabbing at Orpheus, trying to pull him down into their world. The underworld itself is represented by three spinning cubes, the interiors of which are composed of multiple doorways. Here, there are also mirrors. And when the cubes are turned at the appropriate moments (by dancers, of course) multiple reflections of the doorways and characters are created. We even sometimes catch a glimpse of multiple James Conlons in the pit, too. Maxim Mironov (Orpheus) and Lisette Oropesa (Eurydice), with dancers from The Joffrey Ballet in LA Opera’s production of Orpheus and Eurydice, 2018. Photo: Ken Howard. Mr. Neumeier is also adept at small but evocative touches. The boat that brought Orpheus across the river Styx, hangs upside down above the action in Act II, as if it had spilled Orpheus into the scene. When Orpheus is in his bedroom at the top of the show (and later again at the end) he is boxed in with black, lit only by a Rembrandt-like illumination from an open window. Only the muse of love will free Orpheus from this box, Mr. Neumeier seems to be saying. At the end of Gluck’s opera, Eurydice is brought back to life by the gods but Mr. Neumeier has chosen to not take this literally. Though the lyrics tell us that love triumphs over all (“l’amour triomphe”), Eurydice and Orpheus remain in separate parts of the stage. She is off to one side while he sits in a row of theatre seats, watching his dancers. She is alive only in his heart - and in his art - as an inspiration for the ballet he is finally able to stage, and which ends the evening in a glorious finale. Mr. Neumeier has found more than a love story. Orpheus is a story of transformation. His journey is not to hell and back, but begins and ends via a seamless and extremely imaginative loop. 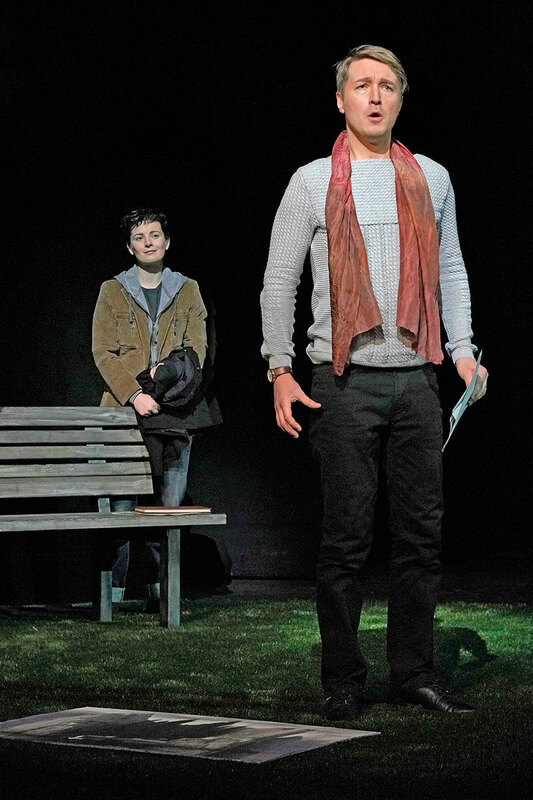 Orpheus and Eurydice is onstage at LA Opera through March 25.